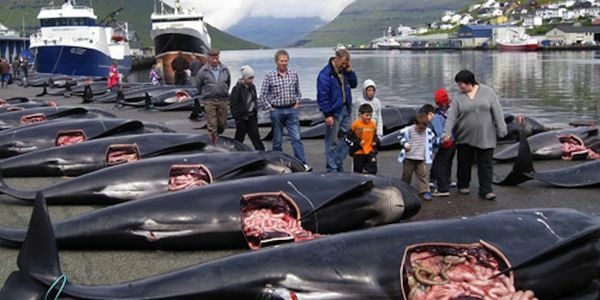 Each summer, thousands of pilot whales are brutally slaughtered in a horrifying "tradition" in Denmark's Faroe Islands. Reports show that the Faroese Coast Guard are used to help find the pods of whales so they can be slain, and to stop activists from protecting the whales. Dolphins and whales are incredibly intelligent, playful creatures. When the hunters surround them to drive them to the shore, the animals don't know that they're about to die - they think they're just playing with humans. Once the dolphins and whales are beached, gasping and terrified, hunters stab the animals in the spines, severing their spinal cord and the major blood supply to the brain. Whales or dolphins that could potentially escape back into the water are hooked in their blowholes and dragged onto the beach, rendering them helpless as the cries from their families rise around them. It is dismaying that the the military is being used to facilitate the killing of innocent whales, whose meat is inedible due to its toxic levels of mercury. Killing these pilot whales - along with bottlenose dolphins and harbor porpoises - is senseless and needs to stop. Please help bring an end to these despicable acts by asking the Danish government to stop supporting these slaughters and to instead step in to stop them. You can help to save many of these pilot whales by signing and sharing this petition to help pressure the Danish government and spread the word to others about this horrifying slaughter. US Secretary of State John Kerry Along with Assistance from UN Secretary Ban Ki Moon - We encourage you to work together to stop the slaughter of the pilot whales, formally condemning the whale hunts and Danish assistance to facilitate them. These pilot whale slaughters are cruel and unnecessary, exemplifying a bloody bath for sick, human pleasure. Take extreme measures to stop these practices and the killing of the pilot whales! !